CABLE HIGHLIGHTS: As was the case the previous week, the Fri-Sun holiday period is going to be light on non-sports original cable programming. ESPN’s coverage of the COTTON BOWL dominated the day at 2.59, with an earlier bowl game at 0.69. 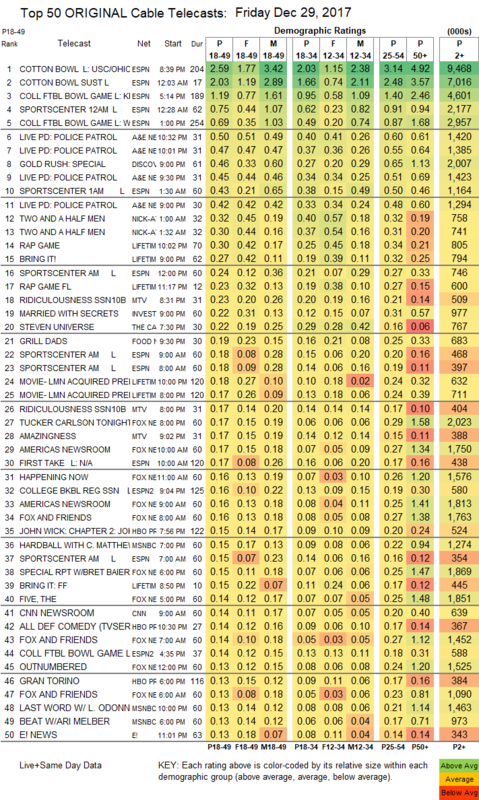 A&E broke LIVE PD into half-hour units, which rated at 0.50/0.47/0.45/0.42. Discovery’s GOLD RUSH special was at 0.46, down 0.24 from the previous week’s regular hour. 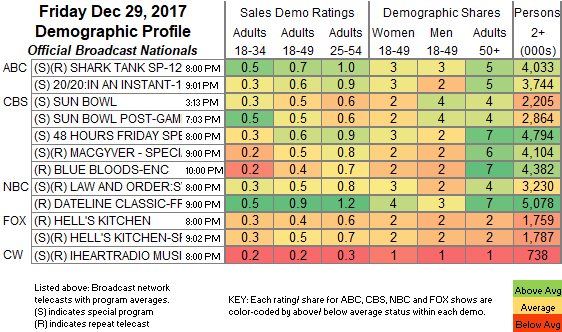 On Lifetime, THE RAP GAME jumped 0.17 to 0.30 (only 0.03 above the rating 2 weeks ago), and BRING IT was up 0.11 to 0.27 (up a tick from 2 weeks ago). On MTV, RIDICULOUSNESS was at 0.23/0.17, compared to last week’s 0.27/0.27, and AMAZINGNESS was down 0.06 to 0.17. ID’s MARRIED WITH SECRETS ticked up to 0.22. Cartoon Network’s STEVEN UNIVERSE was down 0.03 to 0.22. On Food Network, GRILL DADS fell 0.06 to 0.19. HBO’s ALL DEF COMEDY was at 0.14/0.12.